4 Pics 1 Word wolf howling. Black and white image. Forest. Soldiers with swords and castle in the background. Thanks for visiting 4-Pics-1-Word.com, here are the cheats for your favorite game. 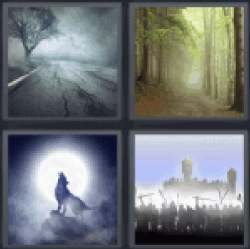 4 Pics 1 Word wolf howling.